Our Bucket Orchids (Coryanthes) are producing a lovely autumnal flush of growth. Some pretty incredible flowers will follow in a couple of months. Here's one of the earliest, Coryanthes mastersiana. Coryanthes mastersiana produces two to three flowers on each inflorescence. It somewhat resembles the Brazilian species Coryanthes speciosa, but the fragrance is very different. 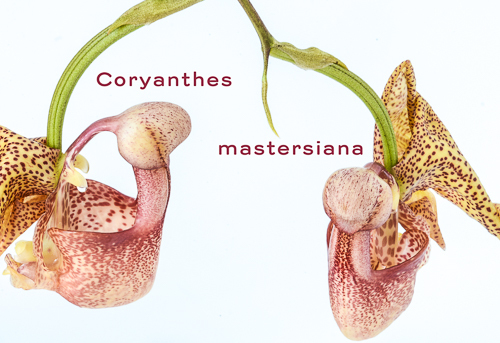 According to Günter Gerlach's website, Coryanthes mastersiana grows together with Coryanthes flava and Coryanthes elegantium in western Colombia and Ecuador. 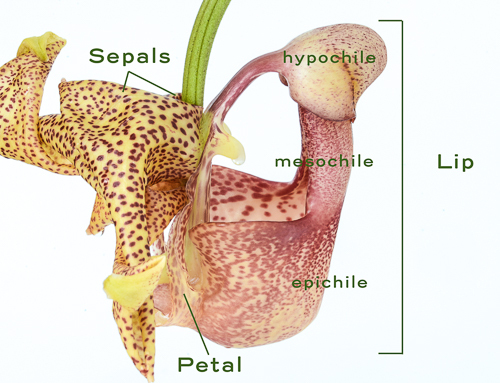 Above is a diagram to help you make sense of the peculiar anatomy of Coryanthes flowers. 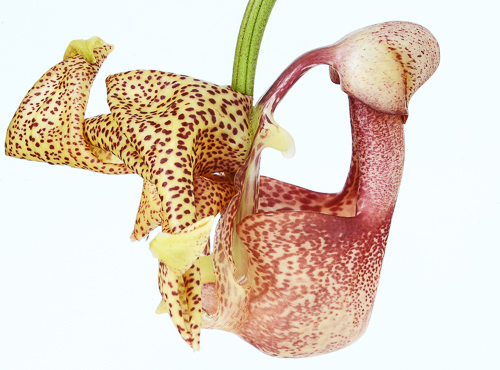 The lip, often the most elaborate of an orchid's three petals, is modified in Coryanthes to facilitate pollination. The bucket, or epichile, fills with liquid from two glands protruding from sides of the column. At the rear of the bucket, and just visible in the photo, is an opening where the bucket meets the anther cap at the apex of the column. When a male Euglossine bee scratches the surface of the hypochile in order to obtain liquid fragrance, he slips into the bucket. With his wings drenched, his only escape is to paddle to the rear opening and force his way through the small opening. In doing so, he rubs up against the sticky end of the pollinarium, which ends up attached to his body. At a subsequent Coryanthes the process is repeated, but this time he leaves the pollinia behind on the stigmatic surface of the column. Coryanthes produce some of the most incredible flowers in the entire orchid family and this year I plan to set more capsules on our plants.